NEW! De Pasquale Combat Ju-Jitsu certification dates! All Systems & Black Belts ARE WELCOME! This will allow all black belts interested to teach this world renowned Ju-Jitsu System in their school.  Complete 4 weekends of training during a 12 month period with each weekend consisting of 20 hours training. In addition to certifications held at the Hombu, school owners have an opportunity to host their own certification at their dojo. The Host of the DePasquale Combat Jujutsu Certification will hold the Certification on 4 chosen weekends. At the final weekend of Certification Training, you will take an IFOJJ 1st Degree Black Belt Certification Test in the DePasquale Combat Yoshitsune System. The requirements of this test must be met to pass the exam. No Certification will be awarded until successfully passing the exam. In addition, you will automatically become an official member in good standing in the oldest Jujutsu organization in the United States, the International Federation of Jujutsuans. All school owner’s, must become a Chartered School in the IFOJJ. Instead of attending a DePasquale Seminar, you can be teaching the combat system. You can also continue learning with the Traditional Waza, which Michael DePasquale, Sr. and his instructor, Junji Saito, taught throughout the 50’s, 60’s, and 70’s and continues today, through his son Michael DePasquale, Jr. Furthermore, you will also be entitled to use the IFOJJ Logo in your school and with your advertising. Attention school owners!!! Super Group Discounts available for 6 or more black belts. Improve your skills, increase your business, develop your own personal knowledge, and enhance your school’s curriculum with the first family of American Ju-jitsu. You’ve spent a lifetime studying and perfecting your art and now you want to expand, but where do you turn? For more than half a century, the DePasquale name as well as the I.F.O.J.J. and F.U.M.A. have been synonymous with the very best that martial arts, defensive tactics, safety, and entertainment have to offer. Seminars and Certifications become the obvious choice, but the problem remains, which ones do you choose? As a martial artist and school owner, the quality of the system you choose is paramount. When choosing a seminar or certification program, go with a name that has a history you can trust ..... The DePasquale Family & MDP Enterprises. Register now for our Combat Yoshitsune Certification Programs! NEW! De Pasquale Combat Ju-Jitsu certification dates! All Systems & Black Belts ARE WELCOME! Soke Michael De Pasquale, Jr.
de pasquale combat Ju-Jitsu with Michael De Pasquale Jr.
for those Black Belts that are still active and are over 18 years of age. We will be paying tribute to all of the Pioneers from the past and more this year. The purpose of this event is to remember, posthumously all our mentors and honor them by practicing the art they passed down to us. The Lineage Image Awards are dedicated for the time one has put into practicing these arts our pioneers have handed down to us. Example; Black Belt- Joe Ferro (recipient) - He is the student of Henry Kennedy, who is a student of Joe Hess, who is a student of Pioneer Peter Urban and also a student of Michael De Pasquale Jr who is a student of Pioneer Michael DePasquale Sr.
Join us this year in honoring the legendary figures who passed their legacy down to you by practicing the arts they pioneered. 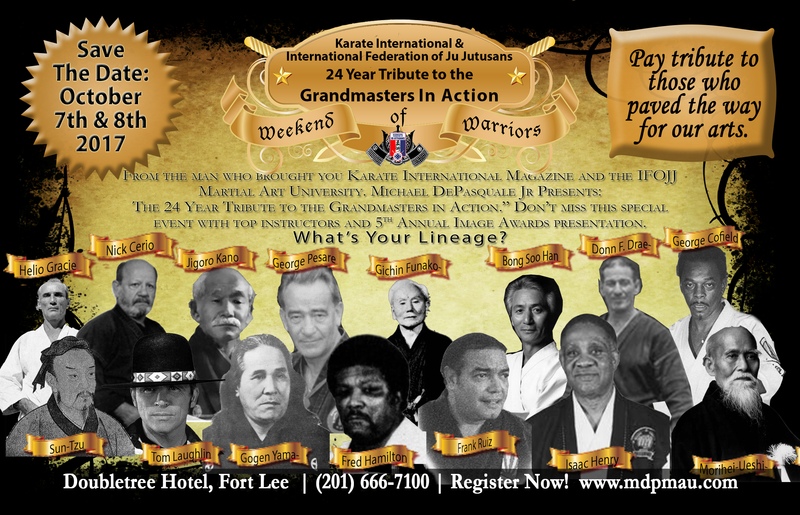 The IFOJJ Martial Art University tribute to the pioneers is coming up. This year we are doing a Lineage Image Award presentation to ALL teachers and students. It is very important that we DO NOT forget where we come from and who paved the way! If you have a lineage that does not relate to those on the enclosed postcard you can still put their names on the lineage certificate you will receive. There will also be a space for you to put a photo. The certificate we are presenting will have images like the postcard enclosed. 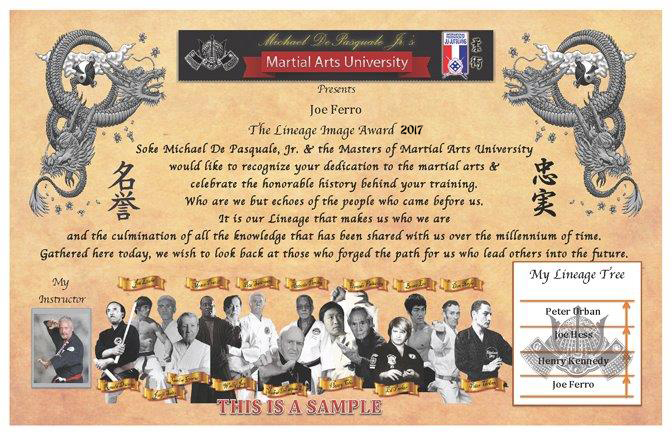 All students will have their name on the certificate along with a lineage that comes from your martial art history. You may list up to five instructors. or Get Your paperwork and student’s paperwork in ASAP!